4. Blue Gingham Mini Baking Cups from Sweet! I love the red gingham clothespins. They would look so cute on the fridge if you attached magnets to the back. Also cute as a "chip clip" in the kitchen to hold bags closed. The Papered Crown also sells a set of clothespins in a rainbow of gingham colors that is absolutely adorable. I don't think it would be possible to have a gingham theme and not mention Cheryl and her blog a pretty cool life. I think Cheryl just might be the queen of gingham. I would love to make a set of her gingham place mats. How can you be grumpy in the morning when you're eating off of something so cheery?!? Make sure you check out Cheryl's famous gingham buntings, too. Back in March I was reading one of Cheryl's posts about making DIY Girl Scout Samoas (my favorite :) I happened to notice the little vintage yellow gingham juice glass that she used as a cookie cutter, and I immediately fell in love with it. It reminded me so much of the drinking glasses my grandmother had. I started searching high and low for a set of my own. It took me three months, but I was able to find the exact same set in red gingham and a slightly larger set in yellow gingham. They are one of my new favorite things in my house. Try doing a search for "Libbey gingham juice glasses". I found mine on Etsy and Ebay. How cute are the blue gingham mini baking cups?!? These would be perfect for mini muffins, which we make a lot in our house. And you can find them in several other colors (and regular size) from Sweet! Cheap, too... a package of 50-60 mini baking cups is only $2.00! I started browsing through the gingham selection at Jo-Ann's the other day, and I think I'd like to brighten up my kitchen with a red gingham dish mat. What's your favorite gingham color? I love Cheryl's blog! Everything is so happy and bright! And I love gingham! I may have to hunt down some of those juice glasses as well. So cute. My favorite color of gingham...aqua of course! haha! Thanks for all the inspiration! There is something undeniably sweet about gingham. I love it in yellow personally. Those vintage glasses are the sweetest! Gingham is so fun. It reminds me of my 70s childhood, too. :) My favorite colors are red, green, and orange when I can find it. I love Gingham! My grandmother used it to embroider wonderful aprons and pillowcase borders and many other items. This takes me back to a wonderful memory, thanks. Great link to Cheryl's blog! Love the placemats. Simple and pretty! Ooh, gingham is so fun! I love it in all colors. 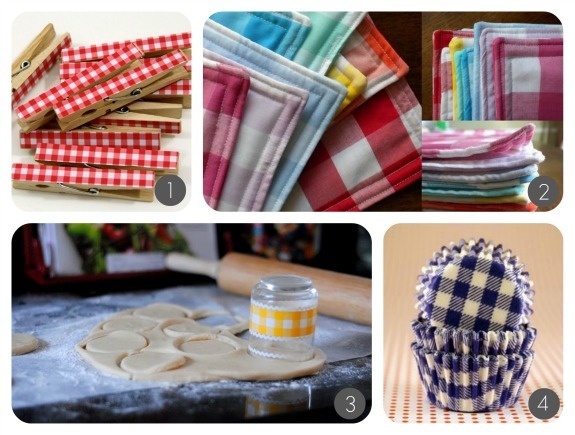 And those gingham placemats are going on my to do list! I would have to say classic red gingham would be my first choice, but it really is bright and happy in just about any color! 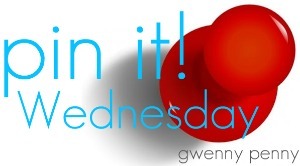 Hi Gwen..I must go and check out Cheryl..gingham is so uncomplicated isn't it..reminds me of simple fun! I just found your blog and am your newest follower. Thanks for leaving me totally inspired.